The NEW DC350. Grafisk Maskinfabrik (GM) has launched a new premium finishing line - the DC350. Get the best in fast and automated converting. Build with semi-rotation in varnish and die cutting as standard. Upgrade with value options like multilayer labels and laser die cutter. This machine combines development work with proven product features. High speed, semi-rotating varnish, job automation and finally inline compatible with all major digital presses. The NEW DC350 definitely sets a new benchmark in the label world. Exhaust Ø100 mm, 800 m3/h. Outside. The DC330FB is designed for the high quality combination printing required in wine and spirits labels. 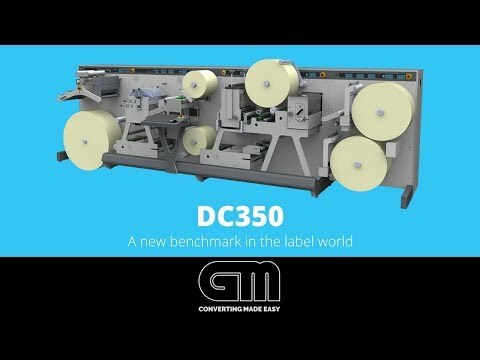 The DC330NANO is the most compact unit in GM’s series of label finishing machines. GM offers a range of semi-automatic turret rewinds for HP INDIGO and XEIKON digital presses. The DC500 converting and finishing product, was specially created for use with digital printing presses.